Shobhini is a Happy Kuverian from New Delhi. 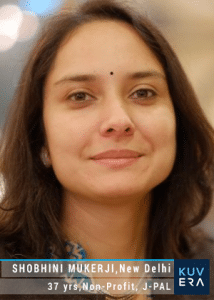 She is a doyen in the non-profit sector and currently works as the Executive Director of the Abdul Latif Jameel Poverty Action Lab (J-PAL)’s South Asia regional center (learn more about the exciting work J-PAL are doing in India here). We spoke to Shobhini about her experience with Kuvera, India’s friendliest Direct Plan Investment Platform. I was looking at online portals to invest through and chose Kuvera for ease of use and goal planning. I’ve not been a systematic investor and usually invested in mutual funds and fixed deposits whenever friends and family advised me to. Despite having a few mutual fund investments, I had no idea about direct plans, commissions, or conflict of interest. Now that I understand what Direct Plans are, I am glad I found Kuvera and don’t have to go through a broker anymore. Coming from a non-profit background, I find the whole hidden commissions and advertising as “free” scam very distasteful. I have a three-year-old daughter. So I am planning for her future while also saving for our retirement and travels. Definitely. The goal planning and investment process has made me better prepared for the things I want in the future. It has also given me a sense of security that I am saving and investing enough. I like the guidance that Kuvera provides as it is easy to understand and quick to implement. As busy individuals (her husband is a lawyer) we usually postpone the financial planning process thinking we are making enough now and that it will be sufficient for the future. It was good for us to put numbers on some of the future scenarios around education and retirement and get a sense of where we are in the scheme of things. Plus, I would recommend them for the quality and promptness of their customer support. The account setup is completely online with no paper work and I liked the innovative use of selfie to do KYC. The goal planning was especially helpful – to think about future goals and including it in the investment process. Now that I we have started, I already feel better that regular investments are being made without any intervention on my part. The small initial effort to start investing feels totally worth it now. What really stood out about Kuvera is how much the senior management is invested with their clients. Gaurav and Neelabh are wonderfully accessible and took complete responsibility with respect to any issues I had. Wish you all the best and waiting for you guys to simplify insurance next. Thank you Shobhini for your kind words and Happy Investing! I would like to give feedback regarding Mutual fund through Kuvera. Still People might not know about Kuvera or have doubts regarding safety. How can I become a #HappyKuverian ? We have contacted you for the same.Thanks.